On September 11, 2011, three lifelong friends—Brendan Mess, age 25, Erik Weissman, 31, and Raphael Teken, 37—were brutally murdered in Mess's apartment in Waltham, Massachusetts. The graphic crime scene was discovered in the early afternoon of September 12, 2011, by Mess's girlfriend, who ran screaming from the apartment. The victims had been dragged to three different rooms and killed there. Their bodies had multiple stab wounds; their throats were slit from ear to ear with such force that they were nearly decapitated, and their mutilated corpses were covered with drugs and money. In addition to the seven pounds of marijuana found on their bodies, $5,000 in cash was left at the scene. Two of the three victims were Jewish, and several sources have identified all three victims as such. The men were described as having been physically strong: Mess was a mixed martial arts fighter, Weissman, a body builder, and Teken, a personal trainer. Their strength, the location of the bodies, and the forensic evidence led investigators to conclude that there had been more than one perpetrator at the scene. Additionally, two unidentified men had been seen at the apartment before the murders, and there was no evidence of forced entry, indicating that the offenders and victims probably knew each other, that the victims had let the killers in, and that the murders were not random. No motive was discovered, but because of the drugs and money found in the apartment and the fact that all three victims had a history of drug use or drug dealing, investigators logically presumed that the homicide was related to the drug trade. The murder investigation went cold until the Boston marathon bombings of April 2013 when the Middlesex County District Attorney's office began actively investigating connections between the crime and the Boston marathon bombing suspects, brothers Tamerlan and Dzhokhar Tsarnaev. What was not immediately apparent is that the same jihadist motivations that impelled the brothers to murder innocent Americans on that April afternoon were the likely motives behind the Waltham murders. Boston bomber Tamerlan Tsarnaev, who died after a shootout with police, had several close connections to the case. One of the victims, Brendan Mess, was described as his best friend; they lived a few blocks from each other, were sparring partners where they spent hours training together, and went to fighting and social events together. Mess and Tsarnaev had once been roommates, and Tsarnaev had regularly visited Mess's apartment where the murders took place. Tsarnaev was one of the last people to see Mess alive but neither attended his friend's funeral nor his memorial service. A relative of Mess's said that animosity had developed between the two friends "over Brendan's lifestyle." On May 10, 2013, news accounts reported that forensic evidence, including DNA from the Waltham crime scene, provided a match to the two Tsarnaev brothers and that records of cell phones used by the Tsarnaevs put them in the area of the murders on that date. Investigators analyzing the Waltham triple murder should search suspects' computers for photos of people with their index fingers pointing skywards. 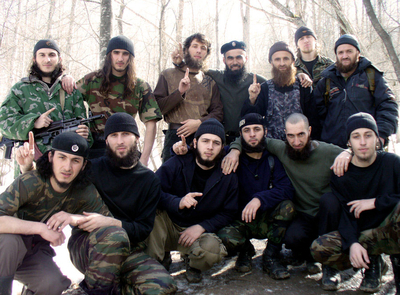 This is an al-Qaeda hand sign commonly used by Chechen jihadists, like those shown here, symbolizing their willingness to be killed for Islam, thus attaining martyrdom and entrance into paradise. On May 22, 2013, a third person of interest in the murders, Ibragim Todashev, was fatally shot by an FBI agent in a Florida apartment while being interviewed in connection with the Boston marathon bombings and the Waltham homicides. Todashev, a 27-year-old Chechen native and former mixed martial arts fighter, knew Tamerlan Tsarnaev and was friendly with one of the Waltham victims when he lived in Allston, Massachusetts. During the interview, Todashev began writing a formal statement implicating both himself and Tsarnaev in the Waltham murders, but before signing the confession, he violently attacked an FBI agent who fired in self-defense, killing him. Reports asserted that Todashev had flipped over a table and threatened the agent with a metal pole or a ceremonial sword that had been hanging in his living room. It was also reported that Todashev confessed that the murders were the result of a drug robbery gone wrong. An official said, "So Tamerlan says they have dope; they rip them off. Tamerlan says, 'They can identify me, so let's kill them.' And they kill them." Todashev's confession is highly problematic. The claim that he and Tamerlan robbed the victims is not consistent with the money and drugs left at the scene. Additionally, Todashev did not provide an explanation for taking the time to pose the bodies by dragging them into three separate rooms and covering them with marijuana and money. In drug-related murders, victims are killed either because they broke the rules of the drug distribution gang, were informants, infringed on the territory of another drug dealer, or stole drugs, money, or other goods from the dealer or the customer. The victims often have a history or association with the drug trade such as an arrest record, a history of drug use, or association with other known drug offenders. The offender almost always will have a known association with the drug trade as a user, manufacturer, or distributor. Although the Waltham victims fit this profile—and it was the most conventional explanation for the murders—the inconsistencies are significant. In a drug-related homicide, the crime scene is usually not staged to mask the true motive or misdirect the investigation, particularly because the intention is to send a message. Mexican drug trafficking cartels, which often mutilate, behead, and display dead bodies in humiliating positions, leave narco messages, and take credit for their kills. In addition, in most drug-related murders in the United States, the weapon of choice is a large caliber and semiautomatic firearm brought to the scene and removed by the offender. Experienced gang and homicide detectives find it highly unlikely that an offender in a drug crime would leave any monies or drugs at the scene, much less such a large amount, just to confuse investigators. Significantly, robbers do not take the time to drag three men into separate rooms and symbolically cover their bodies with drugs and pose their mutilated corpses. It is more likely that Todashev told the investigators the murders were drug-related so as to avoid disclosing a terrorist conspiracy that could reveal other members in Chechnya or the United States. A triple murder, particularly one with ritual aspects, is rare in any city much less in a college town like Waltham. It is not difficult to understand why detectives were working on the premise that this crime was drug-related. Death investigation training typically covers homicide crime scenes that are characteristic of gangs, organized crime, domestic disputes, or property crimes such as robberies and burglaries. Although there is an abundance of terrorism training for law enforcement personnel, instruction usually focuses on threat response and mitigation, first response, physical security, infrastructure protection, and specific weapons detection such as bombs or weapons of mass destruction. Counterterrorism training may also provide extensive information on international terrorist groups, financing, operations, and threats to the homeland. However, there is nothing that prepares local detectives even to consider, much less know how to investigate, jihadist-related murders in the United States. Most police officers are unaware that there even are jihadist-related homicides with similar patterns of specific ritualistic trauma in which perpetrators are Muslim and associated with Islamist ideologies. Particularly, knife wounds to the neck or complete beheading, overkill, and mutilation are indicators of Islamic murder, and there have been dozens of "honor" killings in the West with similar forensic profiles. The most recent Islamist ritual murder occurred on May 22, 2013, in broad daylight on the streets of London when two jihadists used meat cleavers to publicly behead and disembowel a British soldier while shouting the Muslim declaration of faith, "Allahu Akbar." Instead of leaving the scene, they wanted to make certain their attack was not misinterpreted, so one of the men asked bystanders to film him. Holding the murder weapon with bloody hands, one of the killers made it clear that the attack was in the cause of Islamic jihad: "We swear by the almighty Allah we will never stop fighting you until you leave us alone. We must fight them as they fight us. An eye for an eye, a tooth for a tooth." The two offenders calmly waited for the police to arrive and then charged at them with a rusty revolver, knives, and meat cleavers. One of the men shot at the police, but the old gun backfired and blew his thumb off; seconds later they were shot and wounded by police marksmen. Ritual murders appear to be the latest tactic in the war on terror, but they are not recognized as such in homicide investigations. There is no training in jihadist ritual murder and little to none in Islamist terrorist identifiers. Similar to gangs, however, Islamists have emblems, symbols, flags, graffiti, special clothing, hand signs, and expressions that are specific to particular groups as well as to the global jihadist movement. A further impediment to recognizing these connections is that, in 2010, the Obama administration scrubbed all Federal training materials of any references to jihad or Islamism as an underlying ideology motivating extremist attacks around the world because Muslim groups claimed such terminology and discussions were offensive. Political correctness can be most clearly seen in the FBI's Crime Classification Manual (CCM), the standard system for investigating and classifying homicides and other violent crimes. The CCM has categories for "Individual Extremist Religious Homicide" [127.02] and "Group Cause Religious Homicide" [142.02], which accurately describe the crime scene characteristics of the Waltham murders and correctly profile the offenders. However, although the manual correctly details the attributes of a religious extremist murder, it does not include any case studies of jihadist-motivated murder in either the individual or group categories. The manual does include case studies of cults, right- and left-wing ideologically inspired murders, and white and black supremacist-inspired murders but offers no examples of Islamist supremacist homicides. Furthermore, honor killings are not mentioned once in the entire 566-page CCM including in the category for domestic homicide. New sections in the third edition include classifications for biological and chemical attacks, bioterrorism, hostage taking, bombs, explosives, and aerial hijackings, but there are only a few sentences that reference the 9/11 attacks or Islamic terrorist groups. "Islam" is only referred to twice in the entire manual, and curiously, in both instances, the references are in the section that is most applicable to the Waltham investigation. Predominantly, the victim represents the antithesis of the offender's system of beliefs; therefore, victimology depends on this doctrine. If multiple victims are involved, there will be similarities of race, religion, political beliefs, or social or economic status. … Those who carry out religion-inspired crimes concern themselves more with their deity than misleading law enforcement … Therefore … religion inspired crimes are not staged to appear like something else ... The forensics often demonstrate the calling card or signature aspect of the group … In religions that encourage homicide, from violent cults to intolerant sects of Islam, proscription for homicide can be found in writings or preaching of spiritual leaders the assailant identifies with … Religious influence on a crime is reflected in religious symbols and messages at the crime scene. These may include artifacts left behind, religious references in notes, even corpse defacement … a religion-inspired killer adds his or her own sense of holiness to the scene rather than removing items from it. When a killing appears to have a ritualized quality without a sexualized aspect, religious motive needs to be considered … part of a religious ritual may mandate a specific weapon. Use of uncommon weapons, such as swords, warrant special consideration as to their relationship to religious symbolism. These criteria suggest investigating a religious motive for the Waltham murders. Unfortunately, investigators focused on drugs as the commonality among the victims and either did not know that the victims were Jewish or did not understand those implications. It was also assumed that the crime scene was staged as a counter-forensic measure to mislead the investigation. The drugs on the body were interpreted as a way to confuse detectives and steer them away from investigating the crime as a drug-related burglary. Some officials uphold this theory arguing that more money and drugs were probably taken from the apartment while some were left behind. This theory may be based on a previous search of Weissman's apartment where police seized more than $21,000 in cash and a wide assortment of drugs. Specifically, detectives simply had no training to prepare them to recognize the neck trauma as a ritualistic act in keeping with Islamist ideology or to expect that jihadists would commemorate 9/11 with murders and not bombs. There may even be additional symbolic evidence that was initially overlooked or has not been made public such as defiling the victim's Jewish head covering or stab wounds in the eye. Previous jihadist murders have included multiple victims, neck trauma, and "an eye for an eye" symbolic mutilation. If training materials had not been scrubbed of references to jihadist ideology, if the CCM had at least one Islamist example of "Group Religious Cause Homicide," or if investigators were made aware of the signs of jihadist murder and allowed to investigate without the restraints of political correctness, then the numerous pieces of symbolic, forensic, and crime scene evidence found at the Waltham apartment may have led to Tamerlan Tsarnaev long before the Boston bombings. An objective and unobstructed investigation that employs a symbolic analysis of the crime scene produces both an alternative profile of the offenders and motive for the Waltham murders. A symbolic anthropological analysis of a ritual murder interprets the significance of dates, times, places, body position, mutilation, cause of death, symbols, drawings, and other evidence at the crime scene in the context of the perpetrator's cultural point of view. This analysis is different than typical criminal profiling in that it interprets the evidence and violent acts through the meanings that the offender assigns to them as opposed to examining evidence in terms of psychopathy and criminal personalities. This interpretive approach examines how offenders create meaning out of their own experiences by uncovering their cultural beliefs, worldviews, and motivations for violent acts. Many detectives instinctively use the same method, but to be fully effective, it is necessary for them to be aware of the method of operation (MO) and the signs and symbols of jihadist violence alongside those with which they are already familiar. Many European countries are now reexamining domestic violence murders in the context of "honor" killings. In a similar vein, cold case ritual homicides in the West need to be reexamined in the context of a jihadist MO. Unsolved murders that involve decapitation or stab or cut wounds to the neck or cases in which victims were associated with intra-Muslim controversies or allegations of blasphemy need to come under renewed scrutiny. Those crimes that occurred on a symbolic date or in a special place and involved unusual body positioning or other symbolic evidence should also be reconsidered. A symbolic anthropological analysis of the Waltham crime scene in the context of jihadist ideology and propaganda as well as Chechen culture provides unique insights into why the Tsarnaev brothers and Ibragim Todashev likely ritually murdered three men, one of whom had been their friend. The immediate and obvious symbolism was the date of the murders, the anniversary of the September 11 terrorist attacks. Jihadists place tremendous significance on anniversaries and tend to commemorate successful battles against their enemies. On or near every anniversary of 9/11, al-Qaeda releases videos of the attacks on America to commemorate their "success." Most recently, the violent demonstration held at the U.S. embassy in Cairo and the fatal attack on U.S. ambassador Chris Stevens in Libya were undertaken on that date. Unfortunately, the date of the Waltham murders was originally thought to be September 12. The fact that two, and probably all three men, were Jewish is another significant indicator. The Qur'an declares: "O you who believe! Do not take the Jews and the Christians for friends!" (5:51). Many Islamist leaders view Jews and Christians as infidels and enemies of Islam who can justifiably be slaughtered. Strewing the corpses with drugs and money is another highly symbolic indicator. This is so uncharacteristic of a drug-related homicide that the message should be plainly interpreted to mean that drugs and money were not the reason for the murder. It is more likely that the marijuana found on the bodies represented the victims' transgressions—specifically the perceived impurity of drug use—and a sign of moral corruption and lack of discipline. Desecration of the corpses is another method to reveal symbolically the alleged sins of the victims: Rapists are often castrated; snitches have their tongues cut out; thieves have hands cut off, and infidel enemies of Allah have their throats cut ("When you encounter the unbelievers on the battlefield, strike off their heads." Qur'an 47:3). Psychologically, Tamerlan, who was already radicalized, may have still been attracted to the Western lifestyle and needed to eradicate the source of his own desires. Hence, the ritual execution would become in his eyes righteous slaughter, which removes the contagious impurity and seductive influence of unbelievers. This then is not the murder of personal enemies but rather a sacralized act of vengeance against the enemies of Allah. In jihadist ritual murder, knives are the weapon of choice. The knife is reminiscent of the sword, a weapon that is a highly prominent symbol in warrior cultures in general and in Islam, in particular. The sword was the primary symbol of an Arab fighter until the introduction of the rifle and is a prominent symbol in the Qur'an. Qur'anic verses of war that sanction fighting against persecution are called the "sword verses." The sword verses command Muslims to slay pagans, Jews, Christians, and Arab polytheists who fought against Muhammad. Islamist terrorists often cite the sword verses to legitimate unconditional warfare against unbelievers. Cause of death from sharp cuts or knife wounds to the throat often involving near decapitation or complete beheading is also a forensic signature of the global jihadist. Wall Street Journal reporter Daniel Pearl; American civilians Nick Berg, Jack Hensley, and Eugene Armstrong; Kim Sun-il, South Korean; British engineer Kenneth Bigley; Shoshei Koda, Japanese; and American contractor Paul Marshall Johnson, Jr. are just a few of the many victims who were filmed being decapitated by jihadists. U.S. soldiers Kristian Menchaca, 23, and Thomas L. Tucker, 25, were beheaded and mutilated in Iraq, and dozens of civilian Muslims, Christians, including women and children, are beheaded by jihadists every year in the same manner as the Waltham murders. Smiting the necks of enemies is not only theologically sanctioned but has come to represent especially violent mujahideen. Brutal murders involving near or complete beheadings are highly respected by jihadists all over the world. Videos and photos of such killings are modern day trophy heads, badges of honor that bestow heroic status on the killer and generate instant celebrity. Videotaped beheadings are one of the most successful types of Islamist propaganda with particular appeal to young Muslim men living in Western countries who view the violence as vengeance against perceived oppression of and offenses to Islam. Jihadists know that once their videos are uploaded, they will forever be enshrined on the Internet, which is why the recent London attackers wanted bystanders to videotape the violence. It would not be surprising if videos or photographs of the Waltham murders were taken and at some future point appear on jihadist websites. Islamists understand the symbolic power of mutilation. Beheadings function symbolically as sacrificial, initiation, and purification rites. Cleansing Islam of Western impurities and expelling unbelievers from Muslim holy lands is the ideological goal of Islamism. Ritually murdering enemies, either through beheading or suicide attacks, has an additional, personal function of expiating one's own sins, paving the way to paradise. There is good reason to presume that both Tsarnaev brothers and Todashev were familiar with beheadings as a jihadist MO. One of the most popular beheading videos on the Internet is the 1999 Dagestan massacre that depicts the beheading of six young Russian conscripts by Chechen mujahideen. It is brutal even for a beheading video and went viral on the Internet around 2007. In the video, one of the young soldiers begs the terrorists to have mercy on him after he witnessed three of his friends beheaded and one shot to death. While he is being stabbed in the neck and back prior to being decapitated, he calls out for his mother. The video is a "classic" among Chechen radicals, and the murders are uncannily similar to the Waltham crime scene, particularly the method in which the heads of the three victims were pulled back so that their throats could be slit from ear to ear. The Dagestan massacre beheading video could have easily served as a training manual for the Waltham murders. After the Boston bombings, one of the Waltham investigators commented that "their throats were slashed right out of an al-Qaeda training video." With this in mind, investigators should compare the crime scene photos with the photos of the Dagestan victims and search all of the suspects' computers for photos of them with their index fingers pointing heavenward. This is an al-Qaeda hand sign that is commonly used by jihadists, symbolizing their willingness to be killed, thereby attaining martyrdom and entry into paradise. Most significantly, however, the Waltham murders should be viewed primarily as an initiation ritual. This was not a drug deal or burglary gone wrong: It was premeditated murder, an initiation rite that would have proved to other jihadists that Tamerlan, Dzhokhar, and Ibragim were ready for "martyrdom operations" and simultaneously demonstrated that they were not confidential informants. This initiation ritual is how the three radicalized Chechens may have earned their jihadist stripes and proved their loyalty and commitment to the global jihad. It also became the point of no return, the final commitment to a terrorist mission. The murders would have bestowed upon them the jihadist's highest honor—to be dubbed "ash-shahid al-hai"—the living martyr, one who has irrevocably committed himself to dying for the cause of holy war. If the Tsarnaevs were to have backed out of the Boston bombing, it would have meant a loss of face and status, and they would have been reduced to being merely cold-blooded murderers, instead of righteous holy warriors. Once Tamerlan realized he could get away with murder, he traveled to his Chechen homeland and started bomb-making training for his suicide mission. The Waltham murders likely gave the Tsarnaev brothers the confidence to carry out the Boston terrorist attack. Further, as soon-to-be shuhada, they would not be taken alive, explaining why both Tamerlan and Todashev provoked deadly force and why Dzhokhar chose to die slowly hiding in a boat as he looked forward to joining his brother in paradise. The radicalization of the Tsarnaev brothers and Todashev needs to be understood in the context of tribal shame cultures. The men were all ethnic Chechens, a tribal society characterized by blood relations, common ancestry, unwavering loyalty, solidarity, conformity, and most significantly an "us versus them" philosophy. Chechens live by a code of honor and are willing to die and kill to preserve their way of life. Vengeance is required to reinstate and protect honor, purity, and territory. Most significantly vengeance justifies violence and regulates social order. Unwavering family loyalty can be seen in the reactions of Tsarnaev's and Todashev's relatives, including their Muslim convert wives, who immediately and continually maintain that the young men were not responsible for any acts of murder or terrorism and had been set up. Past incidents also show how Tamerlan maintained his Chechen (and Islamist) behavioral norms by "protecting" the family honor: In May 2008, he beat up his brother-in-law after his sister Ailina complained that her husband had been cheating on her and beating her; the previous year, Tamerlan punched a Brazilian youth in the face for dating his younger sister, Bella, because he did not approve of his not being Muslim. In Chechen Islamist tribal culture, honor determines status, respect, and reputation for the individual, family, and community and regulates every aspect of individual and group conduct. If one person is insulted, the entire family is injured; if one person is esteemed, the entire family is respected. Humiliation and honor are felt by all. Honor for men is signified by characteristics of courage, bravery, heroism, power, virility, and strength. Any sign of weakness in words or action is seen as relinquishing honor. It is not surprising that Tamerlan Tsarnaev and Todashev chose to compete in macho warrior type athletics such as wrestling, boxing, and mixed martial arts. One of the most significant differences between Islamists and Westerners is the distinction between what cultural anthropologists refer to as "shame cultures" and "guilt cultures." A shame culture is defined as "a culture in which conformity of behavior is maintained through the individual's fear of being shamed." A shame culture puts high emphasis on preserving honor and on not being publicly disgraced. A guilt cultures is defined as "a culture in which conformity of behavior is maintained through the individual's internalization of a moral code." In shame societies, symbolic expressions ranging from simple mannerisms to acts of violence revolve around avoiding shame and acquiring or restoring honor. Status, appearances, reputation, and honor are more important than notions of right and wrong. In a guilt culture, a transgression is always felt as a wrong, or even a sin, whether others witnessed it or not. In a shame culture, if no one witnesses the transgression, it is not felt or perceived as wrong. Significantly, there is no concept of sin, hence no guilty conscience and no remorse for what Westerners perceive as wrongful acts, including murder. In fact, deception and pretense are acceptable in order to avoid shame and maintain face. There are many indications that both Tamerlan Tsarnaev and Ibragim Todashev followed the Chechen Islamist tribal code of honor, which did not conform to American values, resulting in feelings of not being respected, which could only be alleviated through violence. Violence restored respect and was further proof of masculinity. The two macho fighters were largely supported by welfare and their Muslim convert wives while attempting to compete on the professional circuit. They were both hypersensitive to insult and responded to perceived slights with excessive violence. Tamerlan was arrested in July 2009 for aggravated domestic assault and battery for assaulting his girlfriend. There also were reports that he was abusive to his wife. Todashev was arrested on May 4, 2013, on a charge of aggravated battery causing great bodily harm after getting into a fight over a parking spot with a father and son at an Orlando shopping mall. The son was knocked unconscious and hospitalized with a split lip and several teeth knocked out. Todashev had been previously arrested in 2010 after a road rage incident. "Witnesses told police that he argued with two other drivers and cut them off with his vehicle. According to a police report, he yelled, 'You say something about my mother, I will kill you.'" In Todashev's worldview, this incident was more likely about protecting his mother's honor than about road rage. Todashev had a reputation as a hothead and had been kicked out of several gyms for getting into fights with people and was likely angry and frustrated. For him, the final humiliation was probably a knee injury sustained in a car accident in early 2013, which finished his professional mixed martial arts fighting career. For a Chechen warrior, such an injury would be a sign of weakness, a loss of strength and face. He may have attempted to restore his honor by killing an FBI agent. Similarly, the final humiliation for Tamerlan probably occurred when he was barred from boxing competitively at the national Tournament of Champions because he was not a U.S. citizen, despite having captured a second consecutive title as the Golden Gloves heavyweight champion of New England in 2010. Unable to compete and unable to save face, he would have seen murder and terrorism as a "heroic" way to restore honor. The Blessed Boston Bombings (BBB) have been an absolute success on all levels and domains … By tracking the course, Tamerlan and Dzhokhar—may Allah reward them—ran along April 15 until they crossed their own finish line ... we can confidently say that the real worthy winners of the Boston Marathon were the Tsarnaev mujahideen brothers. For such people, and they are the rule among the violent, even a minor sign of real or imagined disrespect can trigger a homicidal reaction. The purpose of violence is to force respect from other people … Furthermore, any experience that specifically intensifies feelings of shame simultaneously diminishes feelings of guilt and remorse ...Violence from the point of view of those who engage in it does not intensify shame, it diminishes it and even reverses it into its opposite, namely, self-respect and respect from others. Islamist propaganda is designed to convince believers that their honor has been disrespected, their prophet has been insulted, their territory has been occupied, their holy book has been defiled, and they have lost face. Symbols and loaded language are all calculated to trigger feelings of humiliation that can only be assuaged through violence. Exploitation of perceived desecration incidents is emphasized so that violence can be morally sanctioned as a defense of Islamic purity, which has been defiled, transforming murder into a sacred act. Purification through violence is a sacrificial ritual. Shedding blood, including one's own, restores honor and washes away shame. Killing and dying for Islam is considered sacred, and sacred violence is always justified. However, the violence must be transformed into something sacred to distinguish it from profane barbarism. For that reason, jihadist ritual murder must include symbolic gestures such as shouting "Allahu Akbar" while killing someone or reading a list of offenses prior to murder or, as in the Waltham murders, leaving drugs on the body to attest to the sins of the victims. As a result, jihadists can commit unspeakable atrocities without remorse because they consider their deeds righteous slaughter in defense of the purity of Islam. Enemies are not people: They are unclean animals, pigs, monkeys, or dogs, dirt that must be cleansed. Beheadings, throat slitting, body mutilation, corpse desecration, eye gouging, and other unspeakable acts are not atrocities, but rather, they are sacred blood rituals that restore purity and cleanse shame. Sacred killing becomes an ecstatic spiritual experience. Murder feels good. The Forward (New York), Apr. 22, 2013; The Jewish Journal (Los Angeles), Apr. 23, 2013; Daniel Greenfield, "Did Boston Bomber Murder 3 Jewish Men on September 11?" FrontPage Magazine, Apr. 23, 2013. ABC News, Apr. 22, 2013. The New York Times, May, 22, 2013. John Douglas, Ann W. Burgess, Allen G. Burgess, and Robert K. Ressler, Crime Classification Manual: A Standard System for Investigating and Classifying Violent Crimes, Third Ed. (Hoboken: John Wiley and Sons, Inc., 2013), p. 143. Daniel Pipes, "Muslim Acts of Beheading in the West," The Christian Post (Washington, D.C.), June 5, 2013. The Daily Mail (London), May 22, 2013. Fox News, Apr. 7, 2010; "Muslim Influence in Pentagon Prevails; Material on Radical Islam 'Purged,' Outstanding Army Officer 'Disciplined,' TMLC Enters Case," Thomas More Law Center, Ann Arbor, Sept. 17, 2012. Douglas, et al, Crime Classification Manual, pp. 244-6, 273-5. See David Bukay, "Islam's Hatred of the Non-Muslim," Middle East Quarterly, Summer 2013, pp. 11-20. David Pryce-Jones, The Closed Circle, An Interpretation of the Arabs (New York: Ivan R. Dee, 2009), p. 22. Los Angeles Times, Apr. 28, 2013. Pryce-Jones, The Closed Circle, pp. 36-7. Oxford Dictionaries Online, s.v. "shame culture." "Timeline: A Look at Tamerlan Tsarnaev's Past," CNN, Apr. 22, 2013. The Daily Mail, Apr. 23, 2013. News 13 (Orlando), May 23, 2013. The Orlando Sentinel, May 22, 2013. ABC News, May 30, 2013. James Gilligan, Preventing Violence (New York : Thames and Hudson, 2001), pp. 35, 72, 73. Related Topics: Muslims in the United States, Terrorism | Dawn Perlmutter | Fall 2013 MEQ receive the latest by email: subscribe to the free mef mailing list This text may be reposted or forwarded so long as it is presented as an integral whole with complete and accurate information provided about its author, date, place of publication, and original URL.